New Year’s Eve is a night to celebrate all of last years accomplishments and to plan next years goals. There are numerous traditions across the world that individuals take part of to welcome the new year. Since the majority attend events or family gatherings to toast to the New Year, there is an unspoken ritual to dress your best to impress. Regardless of the formality of your celebration, start your New Year’s resolution early by inspiring the fashionista inside you to design your own custom New Year’s Eve shirt. Text tees, tanks, and sweaters are all the rage this year. Design your own New Year’s Eve shirt to celebrate the new year. Think that designing your own tee or tank is too difficult or you lack the artistic ability? 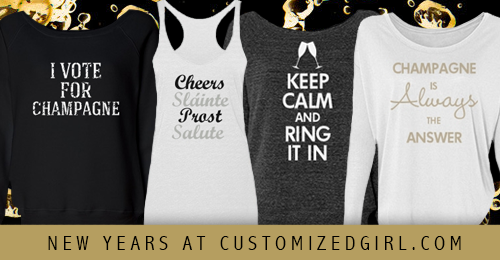 All you have to do is add your favorite New Year’s slogan or simply show your love for champagne. It’s as easy as that. Our design center has a variety of options in product styles, fonts, and art to allow the user to be as creative as they want but also the effortless functionality to achieve the design you are working towards. Customized Girl has already created as assortment of New Year’s Eve designs to either inspire or the option to customize. So what are you waiting for? Get that custom design that will set you apart, pair it with a glittery sequin skirt, your favorite pumps, and ring in the new year! Kick off this holiday season with a Christmas themed marathon or 5k! Christmas runs have become so popular that different themed races are being created. An ugly Christmas sweater run, a Santa run, and a Christmas Story run are just a few to name. The goal to these runs are not only to burn a few calories but to also spread some holiday cheer. Runners dress up in Christmas themed apparel that include Santa hats and ugly Christmas sweaters. 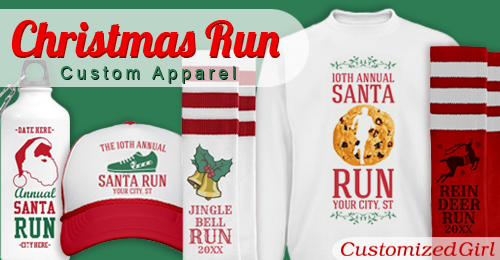 Customized Girl has taken the next step and put together some great Christmas Run designs that will help complete your running gear this year. Customized Girl offer socks, bags, water bottles, and performance wear that are ready to customize with your city and date. You can easily take any of our designs and put it on multiple products. Have a design in mind but don’t see it in our design gallery? Our design center is straightforward and we offer endless amount of options in our Christmas art library. Our Christmas Run Apparel is great for bulk orders and even better for individual runners who want to celebrate their running achievements. Make this year extra special by creating your own unique and fun running gear! The holiday season is one of the most anticipated times of year by individuals all over the world. People look forward to decorating their homes, listening to Christmas music, and most importantly celebrating with their loved ones There are so many customs and festivities that come with the holiday season. One of the newer traditions is the infamous ugly Christmas sweater party. The objective of these parties is to have the most eccentric sweater whether it be funny, do-it-yourself, or so vintage that “no one can believe you found that at the thrift shop” kind of vintage. Since these parties have become so popular it has been difficult to come across that gold mine of a sweater at the local thrift shop and let’s be honest, no one really has the time to glue all that garland. 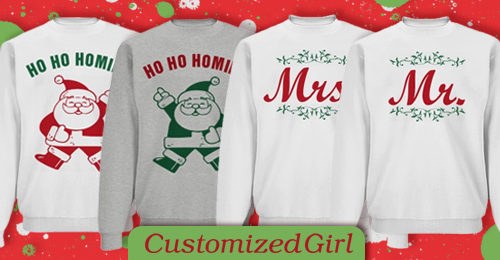 Customized Girl has created cute, clever, and funny matching Christmas sweaters and shirts to help make your search that much easier. The best part about our Christmas sweaters is that you don’t have to be the tackiest sweater at the party but you can be hilarious or charming. Step your game up and create matching Christmas sweaters with your best friend or your significant other. What’s better than one Christmas sweater, that’s right, two coordinating Christmas sweaters. Our design center makes it easy for you to swap out sweater styles, art, text, and colors. This allows your sweaters to be the most custom and unique at the party without getting all that glitter and glue all over yourself. We’ve already put together some matching designs but the options to customize are endless! Christmas is almost here and if you are expecting a new bundle of joy this year it will be even more special. To be pregnant during the holiday season is the greatest gift of all and Customized Girl wants to make it more memorable than the rest with new holiday maternity shirts. So mix together the spirit of Christmas with the happiness of expecting a new baby and spread some holiday cheer! Customized Girl has a variety of cute maternity designs to choose from including a wrapped present, ornaments, snowmen, and our classic peek-a-boo. 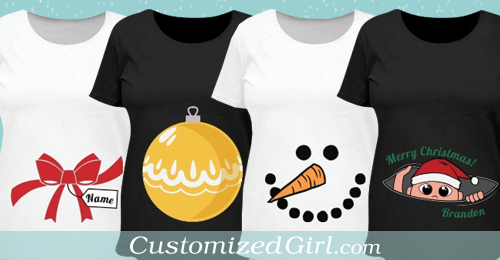 Dress up your baby bump this Christmas or holiday season with any of these adorable designs. Our holiday maternity designs are a great way for soon-to-be parents to announce their pregnancy. Your baby is a gift! Announce the pregnancy on Christmas Eve or morning or let everyone know the new baby’s name in this cute and clever way! It’s a new day and age where sports are no longer just for the guys. Ladies love showing off their sporty side by showing support for their favorite team or rocking their gear on the playing field. Endzone Empress understands the love and passion ladies have for their sports and targets those females who love anything and everything about sports. They offer fashionable, flirty, but yet sporty apparel that will satisfy every die hard sports fan. Most importantly, Endzone Empress is designed by a sports chick for fellow sports chicks. Endzone Empress is a storefront after Customized Girl’s own heart and that is why they are our storefront of the month. 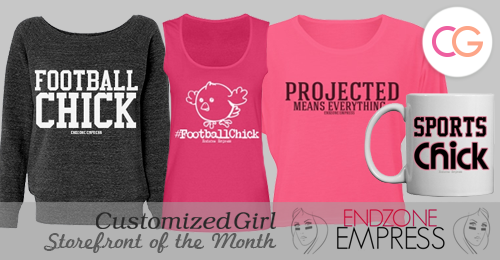 Customized Girl has the best and largest variety of custom apparel for women. We love seeing storefronts seize that opportunity to target a specific niche while creating trendy and fashionable designs. Endzone Empress is a new storefront that is doing a fantastic job of getting their brand out there and marketing across all social media. Are you a lady who loves her fantasy football? Or do you play your heart on the field? If the answer is yes then you should definitely check out Endzone Empress.